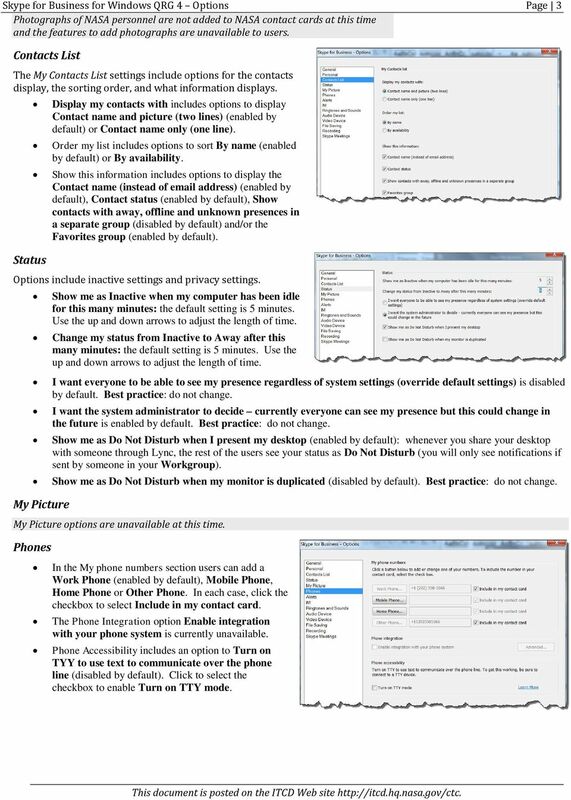 Download "Quick Reference Guide 4 Skype for Business for Windows Options"
2 Skype for Business for Windows QRG 4 Options Page 2 Personal The Personal options include settings for sign in behavior and personal information management, with location and picture settings. The My Account settings include: Sign in address and Advanced options (defaulted to the user s Outlook mailbox). Automatically start Lync when I log on to Windows (enabled by default) logs your computer into the application whenever you log onto the machine. This is necessary so that your co-workers can instant message you or share the desktop in an ad hoc online meeting. Show Lync in the foreground when it starts (enabled by default) brings Lync to the foreground of your desktop when it opens. You can disable this by clicking the checkbox to deselect. The application will still be displayed in the Task Bar (based on the setting in General). The Personal Information Manager settings determine the source of your personal information, out of office message, availability information from your calendar, and storage for IM conversations and call logs. Microsoft Exchange or Microsoft Outlook is selected as the source for personal information. If you do change this setting, you will not have access to your Outlook information. Update my presence based on my calendar information (enabled by default): if Out of Office is turned on in Outlook 2010, then Lync will display that message as your personal note when this setting is enabled. Show meeting subject and location to contacts in my Workgroup privacy relationship (enabled by default): provides privacy settings for anyone added to the Workgroup relationship list enabling them to see meeting subject and location data for Outlook calendar information. Show my Out of Office info to contacts in my Friends and Family, Workgroup, and Colleagues privacy relationships (enabled by default): provides privacy settings for anyone added to the Friends and Family, Workgroup, and Colleagues relationship lists enabling them to see your Outlook Out of Office messages. 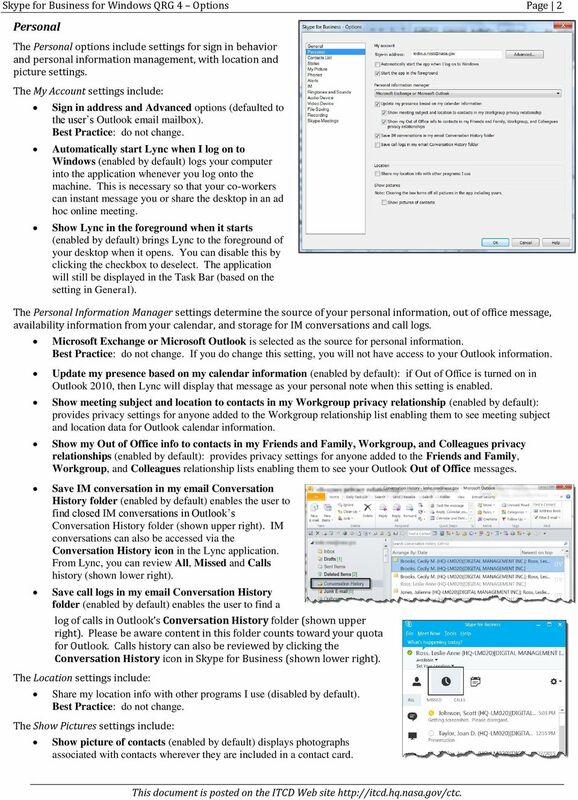 Save IM conversation in my Conversation History folder (enabled by default) enables the user to find closed IM conversations in Outlook s Conversation History folder (shown upper right). IM conversations can also be accessed via the Conversation History icon in the Lync application. 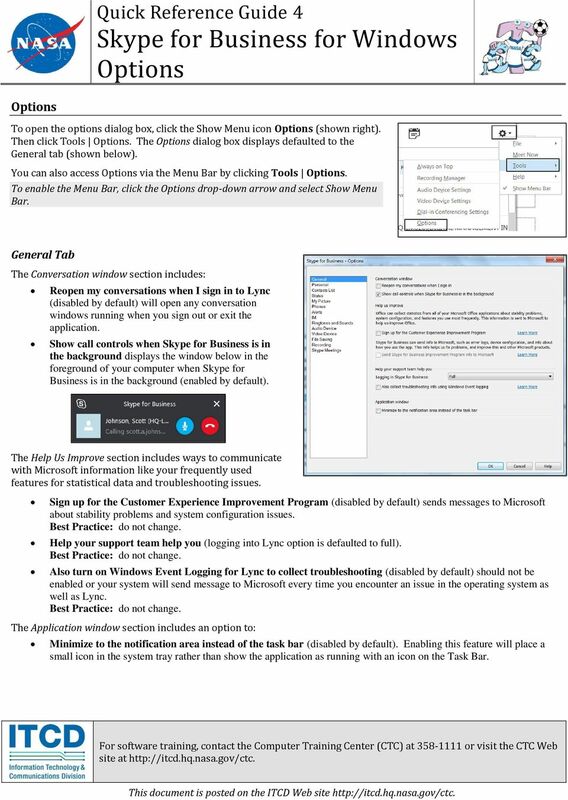 From Lync, you can review All, Missed and Calls history (shown lower right). Save call logs in my Conversation History folder (enabled by default) enables the user to find a log of calls in Outlook s Conversation History folder (shown upper right). Please be aware content in this folder counts toward your quota for Outlook. 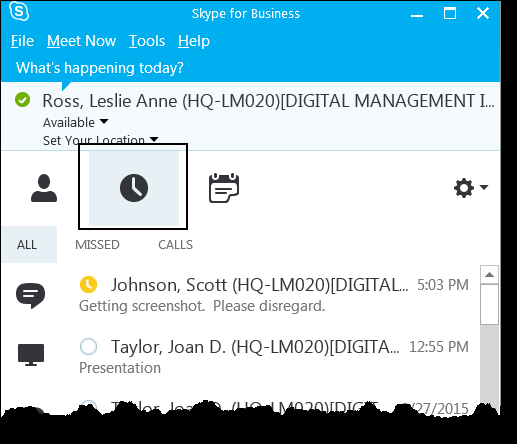 Calls history can also be reviewed by clicking the Conversation History icon in Skype for Business (shown lower right). The Location settings include: Share my location info with other programs I use (disabled by default). The Show Pictures settings include: Show picture of contacts (enabled by default) displays photographs associated with contacts wherever they are included in a contact card. 3 Skype for Business for Windows QRG 4 Options Page 3 Photographs of NASA personnel are not added to NASA contact cards at this time and the features to add photographs are unavailable to users. Contacts List The My Contacts List settings include options for the contacts display, the sorting order, and what information displays. Status Display my contacts with includes options to display Contact name and picture (two lines) (enabled by default) or Contact name only (one line). Order my list includes options to sort By name (enabled by default) or By availability. Show this information includes options to display the Contact name (instead of address) (enabled by default), Contact status (enabled by default), Show contacts with away, offline and unknown presences in a separate group (disabled by default) and/or the Favorites group (enabled by default). Options include inactive settings and privacy settings. My Picture Show me as Inactive when my computer has been idle for this many minutes: the default setting is 5 minutes. Use the up and down arrows to adjust the length of time. Change my status from Inactive to Away after this many minutes: the default setting is 5 minutes. Use the up and down arrows to adjust the length of time. I want everyone to be able to see my presence regardless of system settings (override default settings) is disabled by default. Best practice: do not change. I want the system administrator to decide currently everyone can see my presence but this could change in the future is enabled by default. Best practice: do not change. Show me as Do Not Disturb when I present my desktop (enabled by default): whenever you share your desktop with someone through Lync, the rest of the users see your status as Do Not Disturb (you will only see notifications if sent by someone in your Workgroup). Show me as Do Not Disturb when my monitor is duplicated (disabled by default). Best practice: do not change. My Picture options are unavailable at this time. Phones In the My phone numbers section users can add a Work Phone (enabled by default), Mobile Phone, Home Phone or Other Phone. In each case, click the checkbox to select Include in my contact card. The Phone Integration option Enable integration with your phone system is currently unavailable. 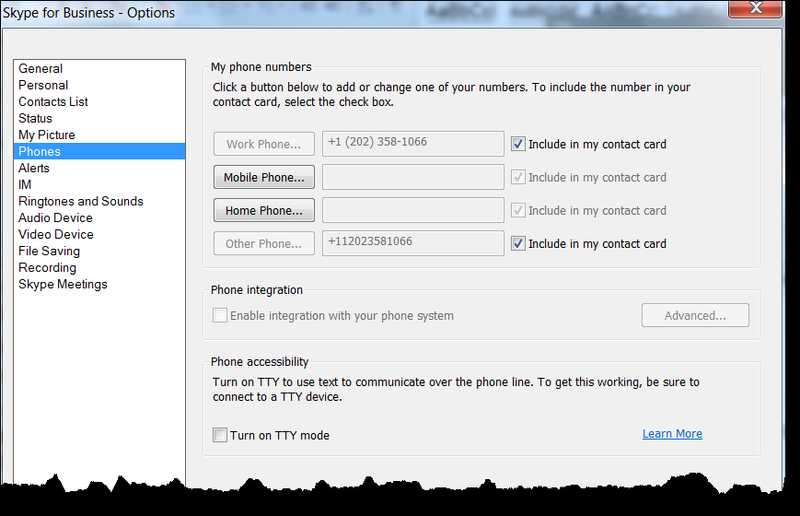 Phone Accessibility includes an option to Turn on TYY to use text to communicate over the phone line (disabled by default). Click to select the checkbox to enable Turn on TTY mode. 4 Skype for Business for Windows QRG 4 Options Page 4 Alerts The Alerts options include general alerts, Do Not Disturb options, and alerts for Contacts not using Lync. The General Alerts option Tell me when someone adds me to his or her contact list (enabled by default) will provide you with a notice when someone adds you to their contact list. Click the checkbox to deselect. When my status is Do Not Disturb options include Don t show alerts (disabled by default), Show only conversation alerts from people in my Workgroup privacy relationship (disabled by default) or Show all alerts, but only conversation alerts from people in my Workgroup privacy relationship (enabled by default). Click the checkbox to change your selection. Contacts not using Skype for Business options include Block all invitees and communications (disabled), Allow invites but block all other communications (enabled by default), or Allow anyone to contact me (disabled). Allow invites from domains my admin hasn t verified (enabled by default) will limit the alerts from people in those domains in your Contact list. IM The IM options include enabling spellcheck, copying options, emoticon options, and tabbed conversation options. In the IM section, you can click to select/deselect Check spelling as I type and Hide pictures IM. When copying IMS options include: Copy message, name and time or Copy message only. Show emoticons in messages is enabled by default, if the emoticon includes animation and you do not want to show it, select Turn off emoticon animations. Enable tabbed conversations is enabled by default. You can also select to Make tabs one line only (shown right). Ringtones and Sounds In the Ringtones section, click the number in the Calls to list and select the Ringtone from the list provided. 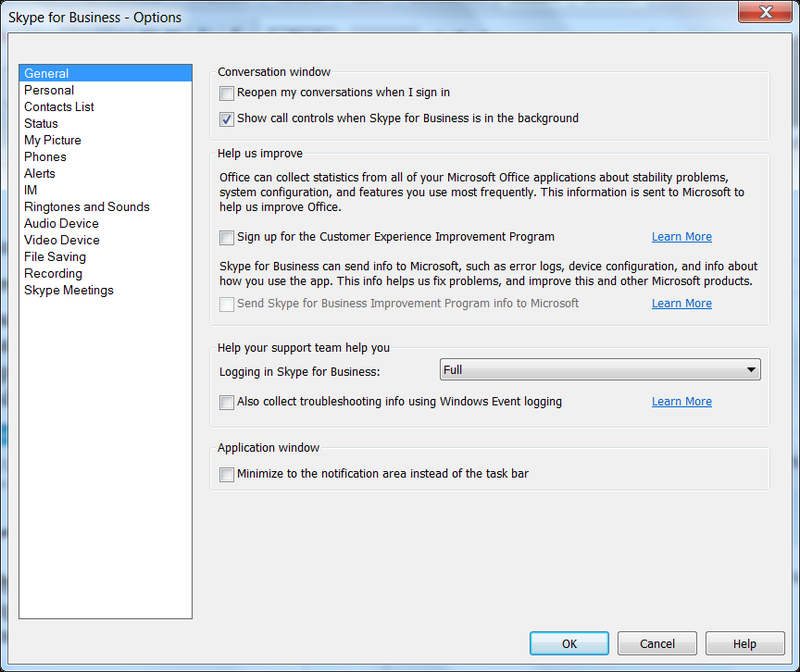 The Sounds options include Play sounds in Lync (enabled by default), Mute incoming IM alerts when viewing an IM conversation (enabled by default), Keep sounds to a minimum when my status is Busy (disabled), and Keep sounds to a minimum when my status is Do Not Disturb (enabled by default). The Play music on hold option is unavailable. Clicking Sound settings opens the Windows 7 Sound dialog box. 5 Skype for Business for Windows QRG 4 Options Page 5 Audio Devices In the Audio Devices section, select the device you want to use for audio calls. Options include: PC Mic and speakers or Other Device (headset if plugged in). Use the drop-down arrows and volume sliders to Customize your device for the Speakers, Microphone and Ringer. Secondary ringer options are unavailable. The Stereo audio playback option Allow stereo audio playback when available is enabled by default. Click the checkbox to deselect if desired. Video Device You can use the Video camera in your computer for a peer to peer (two-way) video call. Be sure you have a headset attached for the audio portion of the call. IMPORTANT: Multi-party video calls are not supported at NASA. If your camera is configured, clicking Options Video Device displays the video camera image. If your video camera is not configured, please contact the Enterprise Service Desk (ESD) at or via the Web site File Saving The File Transfer Save to location default is c:\users\[username]\documents\my Received Files. The folder is created when you receive your first file transfer. If you change the File Transfer Save to location, Lync will return an error something happened to your file transfer folder. Please pick a new folder in Options under File Saving when attempting to view Received Files. 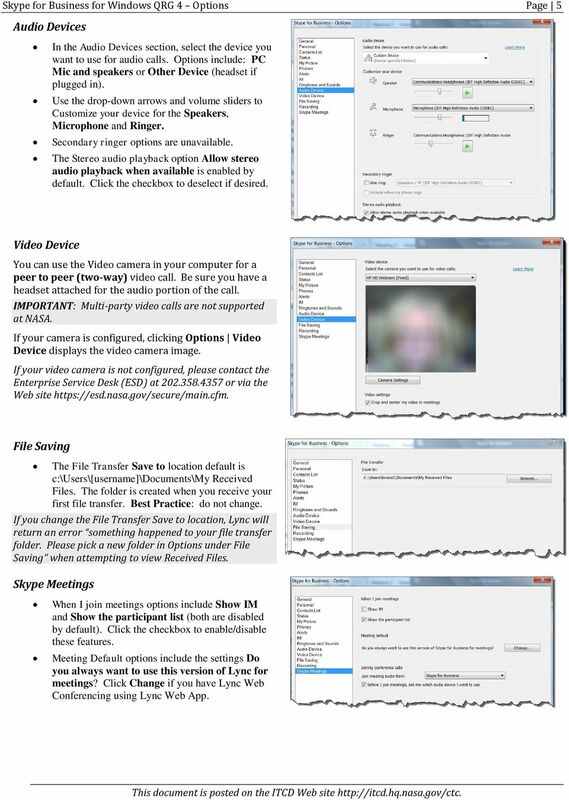 Skype Meetings When I join meetings options include Show IM and Show the participant list (both are disabled by default). Click the checkbox to enable/disable these features. Meeting Default options include the settings Do you always want to use this version of Lync for meetings? 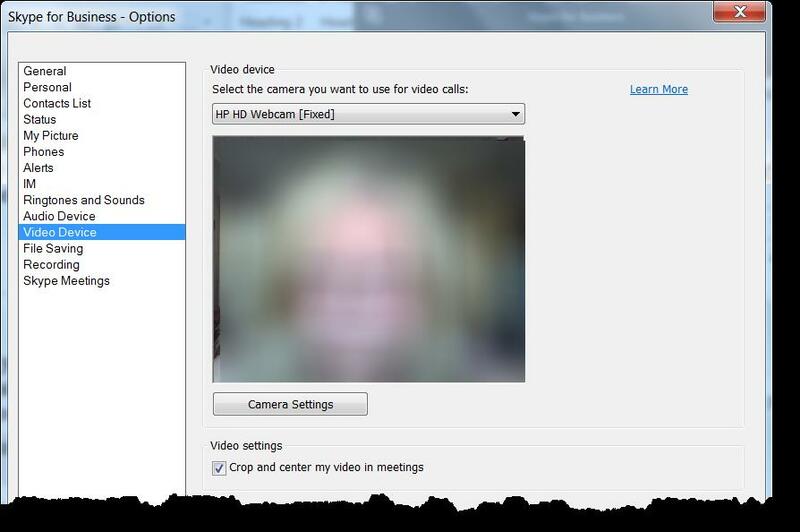 Click Change if you have Lync Web Conferencing using Lync Web App. U N I V E R S I T Y O F S O U T H E R N C A L I F O R N I A USING SKYPE FOR BUSINESS USER S GUIDE OCTOBER 2015 U N I V E R S I T Y O F S O U T H E R N C A L I F O R N I A 2015 UNIVERSITY OF SOUTHERN CALIFORNIA. U N I V E R S I T Y O F S O U T H E R N C A L I F O R N I A USING MICROSOFT LYNC USER S GUIDE MARCH 2015 U N I V E R S I T Y O F S O U T H E R N C A L I F O R N I A 2015 UNIVERSITY OF SOUTHERN CALIFORNIA. Lync 2013 FAQ s. How do I keep my Lync conversation window on top of all the other windows on my computer, so I can see it while I work? Accept an IM request. Set or change your presence. Click anywhere on the picture display area of the IM request pane. HARLANDALE ISD LYNC BEST PRACTICES. 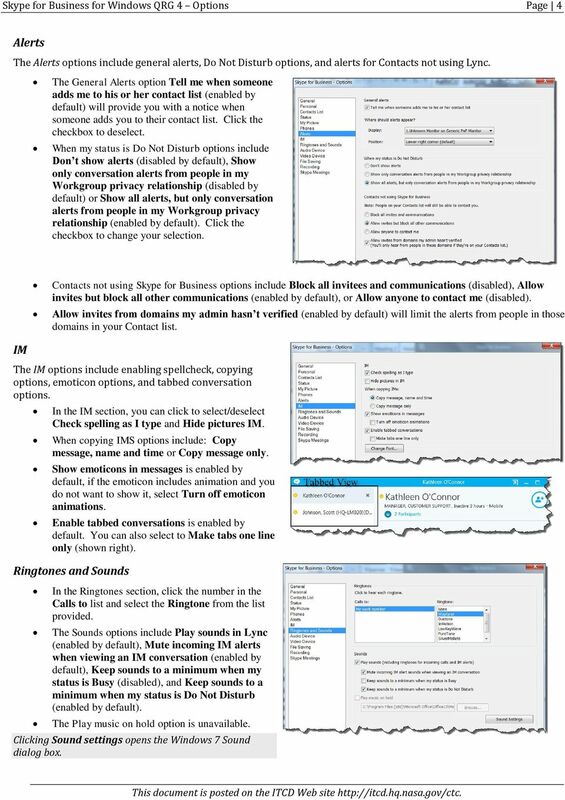 These are the basic user guidelines; including editing your profile, trouble shooting, and Outlook sync. Zoom Participant Guide Zoom is a conferencing solution that provides both video conferencing and screen sharing capabilities. Its high-quality and easy to use format have made it a great choice for istudy.